On An Overgrown Path: "Multi-million arms deals are signed at major music festivals"
"Multi-million arms deals are signed at major music festivals"
That header photo comes from a 2016 Guardian review of a Wigmore Hall recital. 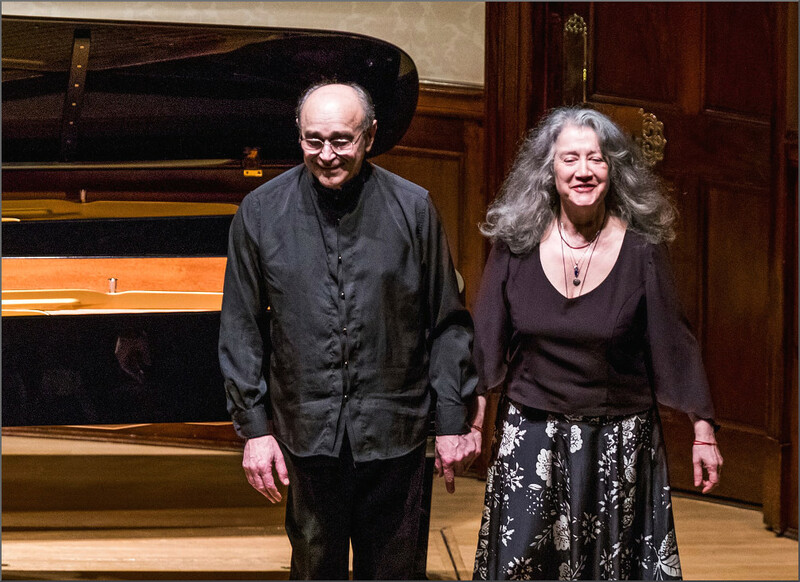 Martha Argerich needs no introduction but her fellow Argentinian and recital partner Alberto Portugheis possibly does. Alberto Portugheis is both a celebrated pianist and teacher, and his masterclasses attract pianists of all ages and from around the world. Like his compatriot Daniel Barenboim he also campaign for peace and human rights, and in 2014 he launched his international movement Humanity United for Universal Demilitarisation (HUFUD). UTC is only one of many 'Merchants of death' companies or conglomerates that use classical music to gain new contracts, thus killing more people and increasing hunger and other forms of human suffering in the world. Sadly, people in Music Management have always, diplomatically and egoistically, decided to ignore this aspect of music life. Many international orchestras travel the world on political/diplomatic missions, even if the players in the orchestra are unaware of how they are been used. Multi-million arms deals are concocted and signed at International Music Festivals, Salzburg or Bayreuth to give just two names. I wish a Peace lover music journalist would dedicate himself/herself to study the Music-War connection. Those are very strong words coming from a greatly respected musician. They must be taken seriously, just as Daniel Barenboim's views on European unity are taken seriously. The links between classical music and the military-industrial complex are not benign. Of course the European Union Youth Orchestra, whose conductors include Bernard Haitink and Daniel Barenboim, does priceless work, and around 50% of UTC's revenues come from its non-military businesses. But, as has long been the case with Gustavo Dudamel, there is a large dead moose in the middle of the concert platform. United Technologies Corporation is the European Union Youth Orchestra's principal and apparently only corporate partner. Annual revenues of almost $20bn are generated by UTC's aerospace and defence businesses which produce military helicopters, jet engines, propulsion systems, aircraft systems and components. The EUYO website describes United Technologies Corporation as ""among the world’s most respected and innovative companies". In fact UTC pleaded guilty in 2012 to supplying technology for China’s first modern military attack helicopters in a serious breach of US arms export controls. The company agreed to pay $75m in fines for the offences, some of which were categorised as criminal. As this thread was sparked by an appeal by EUYO CEO Marcus Marshall for the world to unite behind Gustavo Dudamel against the oppressive Venezuelan regime, it is also worth noting that another of UTC's innovative export violations was, and I quote Business Insider "...the export to Venezuela of a test stand for an F100 engine used for F-16 fighter planes that was falsely classified as commercial because it used only commercial items". The European Union Youth Orchestra webpage highlighting the orchestra's relationship with UTC carries a prominent endorsement from Darcy Nicolle who is Vice President, Government Relations Europe, United Technologies Corporation. As if that job title isn't clear enough, Ms Nicolle self-describes her role on LinkedIn as "Lobbying across Europe for a major corporation". In 2008 Alberto Portugheis was a Nobel Peace Prize nominee; his message is very clear and the classical music industry is steering a dangerous course by citing financial necessity as the justification for ignoring it.